Alex Tsakiris: Your answer is very much in line with Dr. Rupert Sheldrake there, so you guys are on the same page, but I just don’t know how we can walk that fine line of —okay, don’t worry, “science” will figure this out eventually. There are a number of well known out-of-body experiencers who talk about a much more rich spiritual landscape that they feel like they’ve traversed and have come back and tell us about. They’ll tell you about lower levels; they’ll tell you about different kinds of beings, including what we would call evil or demonic beings up to beings we would associate with a lot of religious traditions. They’ll tell you directly that they’re related to some religious traditions. So I guess my point is I think we’re obligated to really take that stuff much more seriously once we cross over and say yes, this really is happening. I don’t know how we can really have such a wall and say it’s all going to be explained. Graham Nicholls: I don’t feel there’s a wall. I feel I’ve explored a lot of those kinds of ideas. I’ve found that those things just didn’t hold up. Alex Tsakiris: Didn’t hold up in terms of as you went and tried to explore them yourself and validate them, you couldn’t personally validate them. Is that what you’re saying? Graham Nicholls: But not just me personally. Also the people I work with… I’ve tried to really dig beyond the preconceptions and step outside of the box a bit and saying, “What might actually be going on,” rather than just going with the presumption that it’s all spiritual and demons and Angels and that kind of thing. If I saw those things or if I saw a consistency across cultures with everyone I worked with, I would take those things onboard. But the thing is I don’t see that so it doesn’t give me a strong reason to take them onboard. Alex Tsakiris: Hi Graham. It’s so great to have you back on Skeptiko. Graham Nicholls: Hi Alex. It’s great to be back on. Alex Tsakiris: So here we are and I was looking over your new book. Fascinating, fascinating. One of the things that really struck me is on one hand it’s a very practical book. It says right in there that the aim of this book is to help you have an out-of-body experience, which is fascinating. We want to talk about that because you really take a rather novel approach to kind of throw in a whole bunch of different techniques at folks. You actually have a really sound scientific basis for why you think that varied approach might work for people. But at the same time, and this is the other part of the book I want to talk about, the book is very much about the science of out-of-body experience and the science-related questions that it raises. So first, am I getting that right? Are there really these two aspects to the book? Graham Nicholls: Sure, yeah. Very much so. I wanted to move it away from the heavily esoteric angle that’s common in a lot of books. And I also really wanted to base the techniques on something solid and just go out there and see what actually works rather than just repeating what so many books and so many other people have been saying for over 100 years. I wanted to see if this stuff will really actually do what people say and so we really have silver cords and energy bodies and all of these kinds of things that are talked about so commonly. So yeah, that was really the aim. Alex Tsakiris: Okay, good. So I tell you what. Let’s leave aside for a second the scientific questions about out-of-body experiences, including about whether they really exist, whether there really is such a thing—I guess that would be one of the first scientific questions. Also, I think we should leave aside for a minute the philosophical questions about what this might mean for consciousness, materialism, questions of the soul, all that kind of stuff. Let’s talk about the practical applications because I think that’s where a lot of people are going to be coming at this from. Tell us about your approach to helping people have these experiences. Graham Nicholls: Well, I think that my approach as well as the scientific stuff that I’ve already mentioned, I think another thing that I really was noticing more and more as I worked with people over time is that people are very different and that some people will have particular skills in a certain area and other people will have completely different skills. Alex Tsakiris: You seem to take this NLP approach, the neural-linguistic program, which I thought was fascinating. Tell us how you came to include that in this. Graham Nicholls: Because it just made sense, really. This idea of modeling what someone actually does when they’re having the experience and then seeing if I can apply it to different people and then seeing maybe more visual people might work better with more of a visual technique than another person. I was just finding that constantly when I was working with someone I’d offer them a technique and they might say, “Oh, I can’t visualize,” or “I’m not very physical. I have various health issues,” or whatever. All different things would come up when I’m working with them. It just became apparent to me to fit the techniques to the person rather than trying to fit the person to the techniques, you know? Alex Tsakiris: Great. Just for folks who maybe aren’t totally up to speed on that, as you mention there some people are just drawn to let’s say auditory stimulation. These are the people who like to listen to music more and can really feel a connection with it. That would be kind of one sign. Then some people obviously are more visual. Maybe they’re more of a dreamer kind of type. So in reading the book you just kind of say go with it. Go with whatever your natural inclination is because you’ve discovered in your out-of-body experience work all those sensory modalities are represented in the experience. So it’s not like an either/or thing. You can just emphasize one or the other as a starting point. Am I getting that part right? Graham Nicholls: Yeah, totally. I think it is a factor that you can really go with the person’s major skill or major sensory focus, but then also bring in all the other senses as well. It’s looking at the person as a whole. A complete approach and a very personalized approach. I mean, even bringing in emotions and things like that. Using an emotional focus such as another person, working with another person so there’s this building of connection which again is backed up with telepathy research and things like that. There’s a strong link between individuals and that can really help with the success rate of someone learning, as well. It’s all about looking at the science, looking at the individual, and really working out the best approach for that person. Alex Tsakiris: You know, Graham, another aspect of your technique that seemed interesting to me and maybe you want to talk about is this idea of immersion. What are you driving at there and how did you come up with that? Graham Nicholls: I suppose in a sense it came from this hypnosis idea again. I think back in 1998 I was working on the first of the immersive structures I’ve built specifically to induce out-of-body experiences. Alex Tsakiris: Tell folks a little bit about that setup and that project because I think it’s fascinating. Graham Nicholls: Well, the first structure I ever built was called “epicene,” and it was essentially a steel structure like a kind of cage that was designed to suspend a platform, a kind of bed, in the center. That was suspended by steel wire so the wire was almost invisible. When someone walked in they would almost see just this floating platform, essentially. They would get onto that and it would flatten out and feel very much like floating. And then there would be some of this—the early version of my intraluminal sound technology and also a spoken hypnotic induction. So it had a few different levels to it. The idea was using all of those senses and the idea suggesting to the person that they were floating put them into that context and would increase the chances that it would trigger something unconsciously and lead to the out-of-body experience. I found very quickly with the intraluminal sound that the vibrational state became very, very common up to 90+ percent of people getting the vibrational state. Then a certain percentage of people beyond that would go into either some kind of remote perceptions such as hearing or perceiving things at a distance, seeing things at a distance, or the full-out out-of-body experience. Alex Tsakiris: Those are just some astounding figures percentagewise, especially in a pretty controlled experiment in terms of everyone’s going through the same experience. You can ask them before and afterwards. That’s pretty impressive. It’s very impressive. Let’s talk a little bit about science. I want to start out with one of the things you said in the book that just struck me. I don’t think there’s anything wrong with it but you say that the design of your techniques is drawn primarily from the science of parapsychology. You want to tell folks how specifically parapsychology research has informed some of these decisions you’ve made and techniques you’ve developed? 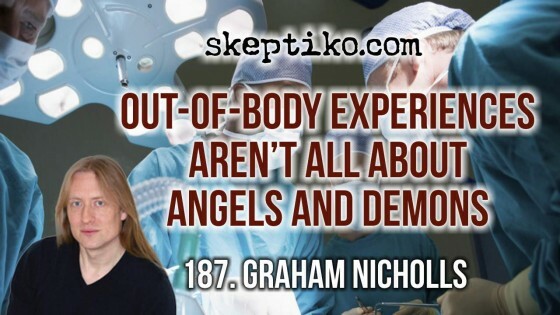 Graham Nicholls: I think they’ve given this underlying inspiration in terms of looking at people like Michael Persinger’s research with the God Helmet or the research of Monroe or even my work with Rupert Sheldrake and the idea of telepathy and the emotional connection between people. I’m just thinking about this idea of is an out-of-body experience actually a psi experience when all of the senses are activated, if you like? So if you think about it in terms of a psychic might describe that they’re clairaudient or they’re clairvoyant or whatever. They’ll often have one sense that’s more developed than another and their information will come through in that way. A few of my friends who are mediums often talk in that kind of context. So that gave me the idea that maybe what we’re dealing with in an out-of-body experience is actually where those psychic functions are all activated so it’s like a complete multi-sensory experience. We’re obviously not really experiencing senses when we’re out in that situation because we’re not seeing light through lenses in a physical body kind of context. There must be something else at play. So it seems to me that we’re almost translating the information that’s coming through in whatever form that might be and as we’re translating that information we do it into something that’s familiar or understandable. That’s more of why it’s in a kind of sensory context, I think. I think that’s also why one sense can be more developed than another or maybe one sense won’t be active at all. Things like that. Alex Tsakiris: That’s fantastic speculation. I mean, it’s really interesting. At the same time, I feel challenged in a way. I remember interviewing Raymond Moody and he would talk about the near-death experience and he’d say, “It’s pre-scientific.” It always used to rub me in the way that Dr. Raymond Moody can kind of grind a little bit on stuff where he’s in the middle of something and can’t just come out and say it. In thinking about that, I wonder if we are pre-scientific. Or maybe even post-scientific because when you talk about those things, and you talk about maybe we are reinterpreting what impressions we’re getting and putting them in sensory terms so that they can be reintegrated into our experience, isn’t that all necessarily by definition outside of what we can really wrap our arms around in terms of measuring? In terms of science? I mean, we can’t even identify these variables, let alone pretend that we’re controlling for them in some kind of experiment. Don’t we have a fundamental problem with science as soon as we step into this realm of consciousness beyond our body? Graham Nicholls: I think I have to agree with you to a certain degree. I think yeah, we are in a situation where at this point in time we’re not quite there for sure. There’s so little out-of-body experience research that’s actually been done. I think there’s still so much potential here to look into all of those kinds of questions. I think what I was meaning more when I was talking about that inspiration and those speculations, as you say, it’s more in the sense of looking at it in a practical way. I was thinking, ‘How can we find ways to enhance all of this in the sense of allowing someone to get more successful results?’ I think that’s what I meant when I talked about the science and the line I was exploring. In terms of looking at it to understand exactly what the experience is I think we really need to do some research. I think it’s crazy there’s so little that’s been done and unfortunately I haven’t really even come across many scientists who are open to doing research in this area. I’ve spoken to a whole range of scientists since our last interview, in fact, about doing some veridical research and doing some research in this area. Most or all of them have either been too busy with other things or not had the resources or whatever. So it’s a real area that’s just under-explored. That amazes me because when you read books that are exploring the science on the topic, they seem to go back to Robert Monroe and start talking about the 1960s and Charles Tart’s research. It’s the Miss Z experiment and things like that. It’s crazy really. Alex Tsakiris: You make a good point because as you’re alluding to, fundamentally it’s a very simple experiment on one level if we ignore the deeper philosophical, materialism, consciousness kinds of things and just say, “Okay, are you able to identify something outside your window? Or fly 1,000 miles away and see it?” I mean, these are high school-level or lower-level kinds of experiments that can be done, right? Graham Nicholls: Sure, yeah. I think your guest a couple of weeks ago made a really good point about that. He’s trying to work in a spontaneous sense, looking at spontaneous experiences. I really agree with that notion because I think historically maybe the problems that have arisen with doing any kind of OBE research is literally just the controllability in the context of putting someone in the lab and saying, “Okay, now just do this,” on tap. Even people of Robert Monroe’s experience found that difficult to do or set limitations on doing that and the depth to which the experience can go, etc. Whereas if it’s done where the experience happens in a spontaneous context and then that’s re-examined afterwards by people who can verify what took place, I think that’s a stronger context. Alex Tsakiris: You’re an interesting person to ask since you have both a personal experience with this as well as experience in helping and working with so many other people who’ve achieved this out-of-body experience. What do you think is going on, as it relates specifically to this mind/brain thing which—as we’ve explored on this show many, many times—seems to be clearly under attack in terms of the materialistic paradigm. That your consciousness is purely a product of your brain, that you’re this biological robot. I mean, I think that’s violated a number of ways. But would you say that this is clearly violated by your experience with out-of-body experience and helping other people? Or is there some way that maybe somewhat of a materialistic explanation for this phenomenon is possible? Graham Nicholls: I tend to lean towards that it’s a combination. I tend to think it’s not either/or. I think that maybe there are factors that are dependent upon the brain and there are factors that are extended beyond the brain. I tend to see it something like that. I don’t think the type of consciousness experienced when out of the body is identical to the type of consciousness experienced within the body. It often has actually more capabilities and more possibilities than you would have in your everyday reality. A student I was coaching online just yesterday was talking about an experience she had where all of her sensory awareness, in fact her sense of reality itself, was more heightened and more precise in the experience she had than in everyday reality. On a broader level though, I think it’s definitely the case that there appears to be something happening beyond the physical brain, for sure. I can’t see any other way to approach it, really, when you’re dealing with people who are flat-lined, for example, in near-death experience situations. And even within the whole OBE literature these experiences where people are so far beyond any way that they could be working in a sensory context. Alex Tsakiris: It was somewhat of an odd question and maybe that’s unfair but I like your answer. Especially the last part. One of the barriers to this is just how it’s so obviously false. You’re outside of your body having some kind of sensory experience without your senses. It’s clearly violating the mind = brain paradigm we’re in because it’s so rigid, the materialism as we understand it, as it’s taught in our science curriculum throughout high school and universities. It’s so rigid that of course this violates it. And the obviousness of that I think sometimes makes it a little bit hard where we have to kind of dance around and go, “Well, you know, it could be this, could be that.” As you say, it might be a little of this; it might be a little of that. At the end of the day we have to say clearly this violates the strict mind = brain model. Graham Nicholls: For sure. Actually there’s another area with all of this that I’m becoming increasingly interested in and that’s the whole area where people perceive an apparition of the person while they’re out of their bodies, which takes place both in near-death studies and in OBE experiences. Some of my students have had situations where they’ve seen someone or they’ve been seen by their closest partner or whatever at another location. That opens up a whole other area, as well. Penny Sartori’s research, as well, one of the significant cases was actually a man who perceived his sister and the sister had actually passed away but he didn’t know that. He was at the point of dying and he was communicating in the ward with his sister and then I think it was about a week later he found that his sister had actually died. So there’s these factors that really challenge and open up this whole area even beyond the idea that just consciousness and the experience of the individual but the experience of other people, as well. This interesting factor of they often perceive the person as they actually are at that particular point in time, even down to their clothes, which is interesting again. Why would you be wearing clothes in this kind of context? I’ve heard skeptics bring this kind of idea up. Why would a ghost wear clothes or why would an OBE person be wearing clothes while they’re out of the body? If you look at it in terms of the consciousness concept, then we think of ourselves, we project ourselves, we experience ourselves in terms of memories and things like that as wearing clothes. So if we’re dealing with some kind of consciousness at a distance then it would make sense that we would project some image of ourselves as we understand ourselves. So this whole other area I find very fascinating related to all of this. Alex Tsakiris: Or they are somehow projecting with us or interacting with us. I agree with you—it does always seem like a rather strange objection on the part of a skeptic to jump past the unbelievable nature of experiencing something outside of your body and then focus on a detail of the clothes or the particular style of the clothes. Why would they wear a robe? Interesting. You’ve opened up a whole other area that I think is important that we get into a little bit because for the most part your book takes a very—I guess you’d almost say—secular approach to out-of-body experience. I’m compelled to dive into this question of the spiritual. It came up in my last episode with Rupert Sheldrake and unfortunately you haven’t had a chance to listen to that because it’s still being edited. Can we really remove ourselves from the spiritual questions here? They seem to be so pressing to me. They’re monumental. I think they’re at the core of our culture, really, and they’re really at the core of science although that’s obscured a lot of times because we get into these really ridiculous sidetrack debates about evolution or religion and all the rest of these. I think fundamentally this is the question we’ve tasked science with. Who are we? And then when we get answers that point us in a spiritual direction—apparitions like you’re talking about or people being deceased and their consciousness being embodied in some—I can’t even say “embodied” because we don’t even know where that consciousness is. But it seems to be able to interact with us. To what extent do we really need to put those issues first and tackle and try and understand that spiritual territory in its broadest sense? Graham Nicholls: I see them as inter-related, really. I suppose I don’t see the spiritual as implying the supernatural, if that’s what you’re getting at. I think for me the spiritual is this level of conscious awareness or this idea of growth and progression and change that takes place through all of these natural factors of reality. I think that consciousness seems to be extended beyond the body and that we experience all of these things without the body and whatever. I think there’s just this underlying aspect it seems to nature and I think that factor will be identified and learnt more about as time goes on through this kind of science. Alex Tsakiris: But aren’t we by definition talking about the supernatural? Talking about something beyond nature because nature is this box that we’ve drawn around in science. We can kind of re-engineer those terms but I think we’re talking about supernatural. Graham Nicholls: I think the definition of nature has maybe broadened from that kind of idea since quantum physics and areas like that. A lot of the notions of how things would have worked in the past I think have now expanded beyond that. I don’t think we’re limited to saying everything is black and white and works in a very mechanical way. I think quantum physics has broadened that kind of idea out. I think now we’re still very much exploring how those interconnections might work on a very, very tiny level. I think that might open up these understandings of what’s going on in a new way. So what might have seemed to be supernatural I think maybe I just see eventually that kind of idea will just become part of the natural, a part of the world that we understand. I think the OBEs and things like that will probably be some kind of interconnection like Brian Josephson’s biological utilization of quantum mechality, this idea that we’re neurons, our brains, our minds are extended beyond the brain itself through some kind of quantum mechanism. Alex Tsakiris: That’s interesting. Your answer is very much in line with Dr. Rupert Sheldrake there, so you guys are on the same page. I’m not against that. I think that once we cross that chasm we have to start trying to incorporate in a whole bunch of other experiences that before we just left on the sidelines. I just don’t know how we can walk that fine line, the fine line that you’re walking in terms of okay, don’t worry, “science” will figure this out eventually. I think once we cross that line then we have to talk about—we were talking about Robert Bruce and his experience. Or I was mentioning Marilyn Hughes, who was a former guest on this show, with Out-Of-Body Travel Institute or something like that. Really, a lot of her ideas sound very strange but I have to tell you, in experiences I’ve had with her she’s demonstrated to me some rather remarkable abilities. Both of those people talk about a much more rich spiritual landscape that they feel like they’ve traversed and have come back and tell us about. They’ll tell you about lower levels; they’ll tell you about different kinds of beings, including what we would call evil or demonic beings and hierarchical beings up to things that we would associate with a lot of religious traditions. They’ll tell you directly that they’re related to some religious traditions. So I guess my point is I think we’re obligated to really take that stuff much more seriously once we cross over and say yes, this really is happening in a way that we think is real or scientific. Then I think these things come into play and I don’t know how we can really have such a wall and say it’s all going to be explained. Graham Nicholls: Oh, sure. I don’t feel there’s a wall. I feel I’ve explored a lot of those kinds of ideas. I’ve studied the Kabalistic interpretations of this stuff; I’ve looked at the astral projection literature, theosophy, all these different areas. I’ve studied them over the years. I’ve been interested in this kind of area and was probably less scientific in the past but more and more I’ve found that those things just didn’t hold up. Graham Nicholls: But not just me personally. Also the people I work with. It became more and more common that I was realizing that a lot of the preconceptions—I mean, a classic one that you can talk about for example is the silver cord. When you read astral projection literature the silver cord is constantly mentioned throughout the literature for going right back probably to Muldoon and Carrington’s famous book in the 1930s or whatever. You’ve got this idea of the silver cord being there but then when I’ve actually worked with people they pretty much unanimously say to me, “I haven’t seen a silver cord. I haven’t experienced one. What’s going on? What’s going wrong?” That’s what they sometimes say to me. I think we get into a problematic area. My first teacher when I was around 15 turned around to me one day and said, “Albert, of course you can’t see in color when you have your out-of-body experiences, can you?” And I looked at him, quite confused by that. But because of his ideas that he’d drawn from Alice Bailey and various theosophical traditions he believed you had to be over 18 or a level of maturity before you would be able to see in color. My experience was colorful from the beginning. My very first OBEs were very colorful and even rich blue energy was around me when I had my first OBE when I was around 14. So I started to question a lot of those kinds of ideas. It’s not that I’ve ever dismissed it; it’s more that I’ve tried to say, “Well, is this really what’s going on?” I’ve tried to really dig beyond the preconceptions and step outside of the box a bit and saying, “What might actually be going on,” rather than just going with the presumption that it’s all spiritual and demons and Angels and that kind of thing. If I saw those things or if I saw a consistency across cultures with everyone I worked with, I would take those things onboard. But the thing is I don’t see that so it doesn’t give me a strong reason to take them onboard. Alex Tsakiris: Great. 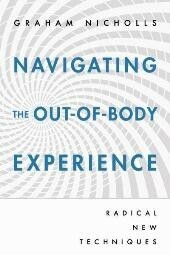 So Graham, for folks who are interested in getting their hands on Navigating the Out-Of-Body Experience, how do they do that? Is it on Amazon? I’m sure it’s on Amazon in the UK. Can you also get it from Amazon in the U.S.? Graham Nicholls: Actually, it was published in the U.S. through Llewellyn so it’s got very good distribution. It should be in bookshops and on Amazon. Alex Tsakiris: Great, so it’s easier to get in the U.S. than to get in the UK, huh? Graham Nicholls: It is, indeed. Yeah. Alex Tsakiris: Tell us a little bit about your personal training. I understand you’re still doing that for people who want to personally have the best chance of having this kind of experience. Graham Nicholls: I’ve developed that whole program quite a lot so now I work in a one-on-one way with people over a month or two months or however long they want to work. They get to use my intraluminal sound technology through that, as well. And yeah, I just guide them through work with a personalized program. You use a diary that they can put notes in and then we improve and go step-by-step through the process. Alex Tsakiris: The easiest way to probably find you, Graham Nicholls, “OBE” would probably get you there in a Google search? Graham Nicholls: Sure. Just Graham Nicholls. It comes up on top. Alex Tsakiris: Okay, great. You’ve mentioned that you tried to make connections with researchers to move this forward in the lab. Any prospects for that in the near future? Graham Nicholls: I was talking to a couple of researchers in the UK who are interested in doing a bit of research. I’m waiting to see what happens on that. I’m also doing some research with the intraluminal sound in terms of beneficial applications of working with people with various problems like drug addiction and things like that. It seems to get people to a very positive balancing state of awareness which seems to help with those kinds of things. It’s already been tried with a small group and there’s possibly a pilot study happening in around six months in Ireland. There’s a few exciting things on the horizon with that. Alex Tsakiris: Well, Graham, it’s fascinating work and a great book. I hope everyone gets a copy of it and tries some of these techniques. You have to create some space in your life and get into that mode where you can really relax and let go a little bit, which was a challenge for me but I think it’s really worthwhile. Best of luck with the book and thanks so much for joining me today. Graham Nicholls: Thank you. You’re welcome.